Radiofrequency to coccyx interdisc, pulsed radiofrequency to ganglion impar, and coccyx removal are all being used in recalcitrant cases. Magnetic resonance imaging findings in the painful adult coccyx. the 67 patients with a rigid coccyx mainly showed abnormal features at the tip (37 cases vs. 7 for the joints, p < 0.001)”. Hence ascertaining whether coccyx mobile or not is useful. 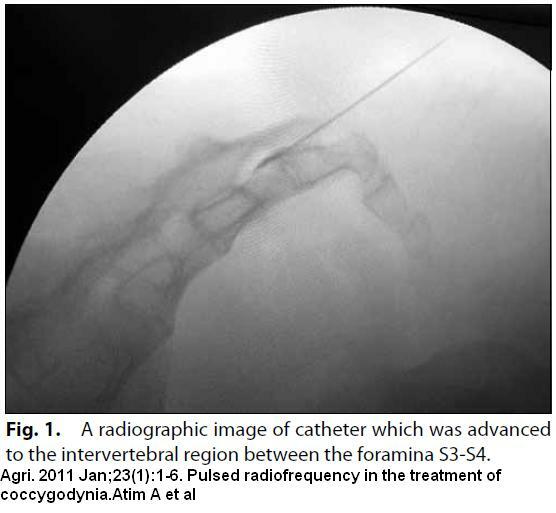 Radiofrequency ablation within the first intercoccygeal disk for coccygodynia: a case report. – localization of her pain at the disk between the 1st and 2nd coccygeal vertebrae. Radio frequency ablation (RFA) was then carried out at 70°C for 80 seconds, followed by injection of 20 mg of methylprednisolone. J Pain Symptom Manage. 2010 Jun;39(6):e1-2. Fluoroscopically guided ganglion impar block by pulsed radiofrequency for relieving coccydynia. Usta B, Gozdemir M, Sert H, Muslu B, Demircioglu RI. did do trial block with 3 ml 1% lidocaine through transsacrococcygeal disc and I presume it helped temporarily though they did not say. 42 degrees centigrade for 240 seconds. Pulsed radiofrequency in the treatment of coccygodynia. Cannula was advanced to the intervertebral region between the foramina S3-S4 with anteroposterior fluoroscopic imaging. In the 16 cases without surgery, pain level was initially 9/10 and dropped to 1.5/10 at 3 weeks and 6 months. All together, 81% was considered successful at 6 months. Chin J Traumatol. 2011 Feb 1;14(1):25-8. Injury. 2007 Oct;38(10):1183-8. Epub 2007 Apr 6. Coccygectomy for coccygodynia: do we really have to wait? Where intradiscal pains are present, steroid inject into disc area, followed by rhizotomy (if temporary relief) could be valid. Now it looks like simple pulse radiofrequency to ganglion thru sacro-coccygeal joint may work as well. This entry was posted in coccygodynia. Bookmark the permalink. Good Luck trying to get a HELP if workers compensation is involved after suffering “Tailbone Injury” their WCB medical consultant states, fractured tailbone usually does not require any treatment, it heals on its own, without any treatment. FYI:In BC Canada, Injured truck driver, had coccyx injury. Even though he had numerous, radiological investigation, MRI, CT scan’s, X-Rays, Bone scans, Dynamic sit-stand x-rays, etc. In his January 9, 2002 report Dr. P2, an orthopaedic surgeon, noted that the worker came to see him regarding the advisability of removing his coccyx. He noted the worker’s belief that there was “luxation of the coccyx between the 1st and 2nd coccygeal segment.” Dr. P2 indicated that it would not be in the worker’s best interest to have the coccyx removed, as the surgical trauma was likely to increase his chronic pain syndrome. In a September 11, 2002 claim log entry the case manager (workers comp) noted that she had advised the worker coccyx surgery would not be approved as the worker’s previous specialists did not expect he would benefit from surgery. In his September 18, 2002 report Dr. P3 indicated that the worker had exhausted non‑operative management and had ongoing pain and clicking. He thought a coccygectomy was reasonable. Dr. H indicated in his April 14, 2003 letter that the worker’s recovery had not progressed as well as expected and he remained unable to return to work. He considered the worker continued to suffer from severe protracted chronic daily pain. He noted the worker was unable to sit and required daily use of regular potent chronic medication which might affect his alertness and impair his ability to drive safely and work at other occupations. He urged a reconsideration of the worker’s eligibility for disability benefits.